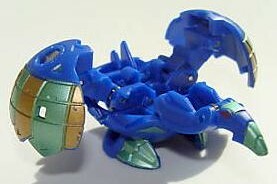 Wired is a bird-like Mechanical Bakugan, designed by Professor Clay, which combines with Altair to form Meta Altair. Wired has a large, indestructible beak. Small in statue, Wired is impossible to hit. With his tiny spinners, he can hover over his prey. His wings consist of five razor sharp feathers that help him fly as well as battle. Wired uses his clawed feet to shred his foes during battle. Purchase Wired from Amazon now!